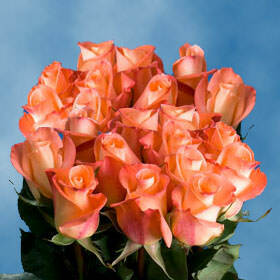 Out of all of the Peach Color Roses there is no equal to the Donna Rose. It is truly a unique specimen as its lavish color strikes with great intensity and beauty. The perfect centerpiece addition for spring or summer events such as Easter, spring or summer family reunions, Lady's Day parties, or that perfect full bloom spring wedding. When used in a bouquet, it adds a nice touch of color to any floral arrangement. Not only is it an easy match for spring and summer festivities but also beach themed events. Having a part by the ocean? The Peach Color Rose will serve to bring out the sandy color of the beach and be a perfect contrast to the blue ocean. Your shipment will arrive to your doorstep fresh, thanks to our high quality packaging techniques. All of Globalrose.com's greenhouses use the latest technologies to insure consistency and quality. All of our greenhouses are located in the warmest and most fertile of locations to be able to provide all year round service. When you are in need of florets Globalrose.com will be open for business awaiting your next order or anything you may need. Also, Globalrose.com only ships with FedEx, an industry leader in shipping, to make sure your order arrives when you need them.